In this article I would like to write about my experiences with both Qlikview and Xcelsius which I hope will give you a better understanding of which product you may want to go with. In this category, Xcelsius in my opinion wins hands down. 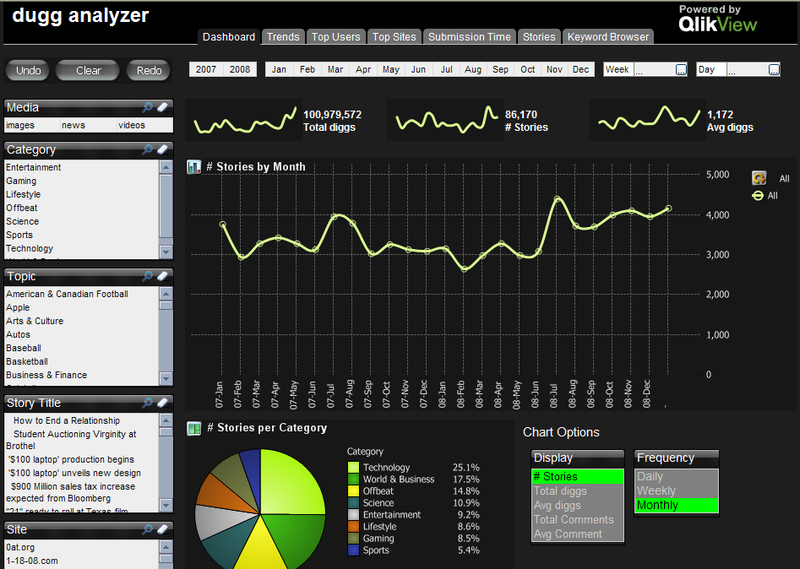 The charts, gauges, dropdowns, etc have much more of a 3D bubbly feel compared to Qlikview. At the end of the day this may be what executives would prefer since people in general are more interested in things that are more pretty. 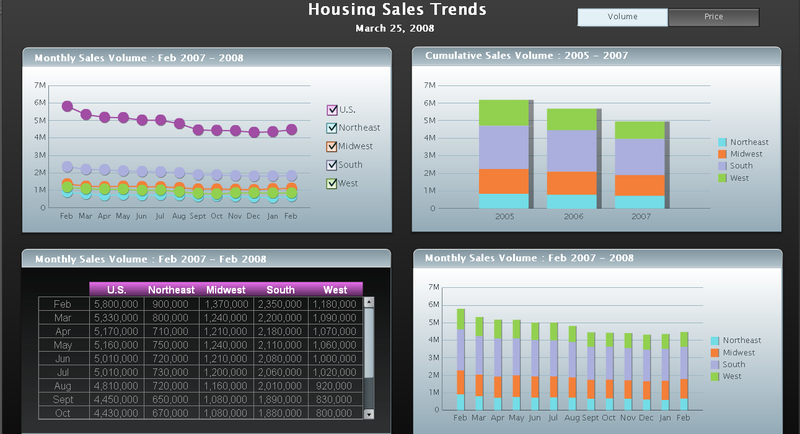 Here are some examples of a dashboard from Xcelsius and a dashboard from Qlikview. This is a follow-up discussion to an article that was posted on 11/19/2008 with instructions for passing data from an Xcelsius file to a prompted Web Intelligence report. This example provides instructions for passing data from an Xcelsius dashboard to a parametrized Crystal Reports 2008 report — in BusinessObjects Enterprise XI 3.1 and Dashboard Builder 3.1. Before getting started, it is important to state that the functionality of Interportlet Communication (IPC) is only available in Dashboard Builder 3.1 (and within BusinessObjects Enterprise XI 3.1). Let’s start by creating a parameterized Crystal Report. In this example, I will be using the Islands Resort Marketing Universe (that comes packaged with BOE XI 3.1) to create the report. The screenshot below is from a simple Crystal Report with a parameter added for the Country field and set to prompt for input. The name of the parameter field is “COUNTRY”. Posted in: Crystal Reports, Training, Xcelsius 2008. Starting Xcelsius 2008, one can create and add custom components (A.K.A. Add-Ons) to the existing out-of-box repository of components with the help of Xcelsius SDK and Adobe Flex. Last year, I conducted a survey for Xcelsius Add-Ons wish list. This series is all about elaborating on the results of that survey. One of the desirable Add-On components was this Visual Graph. The Visual Graph is a Flex Component for visualizing data. The component makes it possible to show complex data structures in visual way. It uses Interfaces which are easy to adapt for your own needs. You can implement your own algorithms. Choose the layout option “Force Directed” for moving the notes of the graph with the mouse. All depending knots and leaves moving to their new position like pulled on a rubber band. Play with the options on the left. The transformations from one mode to the other are very smooth. Although many Xcelsius Developers do not have Flex Expertise and Vice Versa, it would be great to see companies like Centigon and Antivia to come up with such components. In this video, learn how to use the calendar component in Xcelsius 2008 to add additional functionality to your dashboards. Often end users want to pick and look at the numbers for a given date. In such scenarios you can always use the out of component from Xcelsius 2008. Watch to know more.